A. Any extra length which you may need when putting the handle bar in a higher position, can best be get rid of by putting it in front of the tie wrap on the foot slider. C. Cable length even better, the slight extra length is in front of the tie wrap on the foot slider. D. Dangerous. If the tie wrap on the foot slider breaks, the excess amount of cable has too much slack and could possibly hook under the quick release of left drop-out. 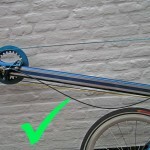 As long as the quick release point downwards the likelihood for this to happen is small, but nevertheless make sure the replace the tie warp as soon as possible and only ride your rowingbike after you made sure the cable can’t hook behind anything. 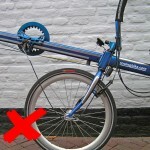 If necessary, pull the gear cable upwards as a temporary solution, creating a loop at the top of the handle bar. 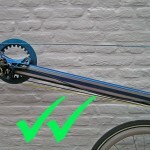 Do not mount anything on the left side of the front fork, not even a bike computer, put it on the right, so the gear cable cannot hook behind it. 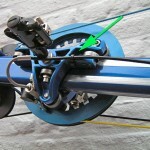 Point the quick release handle of the front wheel downwards, this way the gear cable needs to be even longer before it’s able to hook around the quick release. If you need to ride with a hand loose, for example because you want to point out the direction your going or because you want to get your water bottle, do this while your legs are lying stretched and let the bike freewheel. You can’t lift your hand during a stroke, your handle bar will then make a sudden swing and you’ll be immediately next to your bike. Practice freewheeling with just one hand on a silent road or on an empty parking-lot before doing it in normal traffic. Wear a helmet while on the rowingbike (or any other bike). Wear clothing that stands out in traffic, so your noticed better by other road users. Make sure that you always ride with tension on the armstroke cable (the cable that goes from the top of the steering bar to the footslider). Once you are an experienced rowingbike rider you always have tension on the armstroke cable. Always ride with two feet clicked in. When you start to ride with one leg only use very little force, you can put enormous asymmetrical forces on the foot slider and bow sprit when driving with one leg. Once you have two feet on the pedals you can go full force!! (For disabled people with one leg we reinforce the foot sliders with more bearings). Riding with one hand on the handle bar may be dangerous on a rowingbike. After finishing the stroke, let the rowingbike freewheel and remain on your bike with stretched legs. In this situation steering and indicating direction, rubbing in your eye, waving or what ever is safe. It’s very dangerous to take away one hand of the handle bar during a stroke. With your other hand you will keep on pulling and your wheel will overturn violently and you will be launched to one side of your rowingbike. Practice indicating and fetching you drink bottle at low speeds of safe terrain prior to doing it in every day traffic. Waving remains a treacherous activity on a rowingbike. You’ll want to do this spontaneously when seeing someone familiair, but you need to finish your stroke and freewheel your rowingbike. So, yell “hi” of “hello” instead! On a rowingbike you’re lower and faster than other traffic participants may expect. So, ride highly defensive and always assume others overlook you. Just do not take risks, it may go without incident a thousand times, but the 1001st time does hurt a lot!! !